Don’t let the graph mislead you. Prices have not come down since the second quarter. The majority of the floor plans being sold in the last two quarters sell at lower Per-Square-Foot-Prices. The average price per square foot for condos built after 2001 increased 10.5%. Last year’s sales increase of 2.8% was slightly misleading. One third of condos built after 2001 increased 4.7%-9.8% in price. While looking at the overall market provides a good overview, it does not show the disparity between different condos in Panama City Beach. For example, two-bedroom condos in Panama City Beach range from $212 PSF (Per Square Foot) to $383 PSF. Different floor plans are going to see price increases at different times. Panama City Beach condo sales volumes are 12.8% above the same period last year. When you consider that 2017 had a 40% sales volume increase from the prior year, this is impressive. 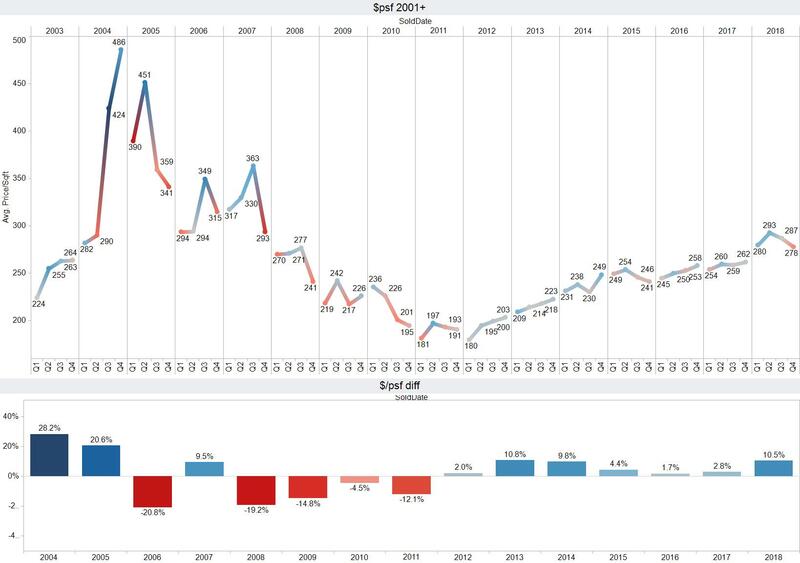 Preconstruction buyers from 2000-2008 are supplying the majority of listing inventory. 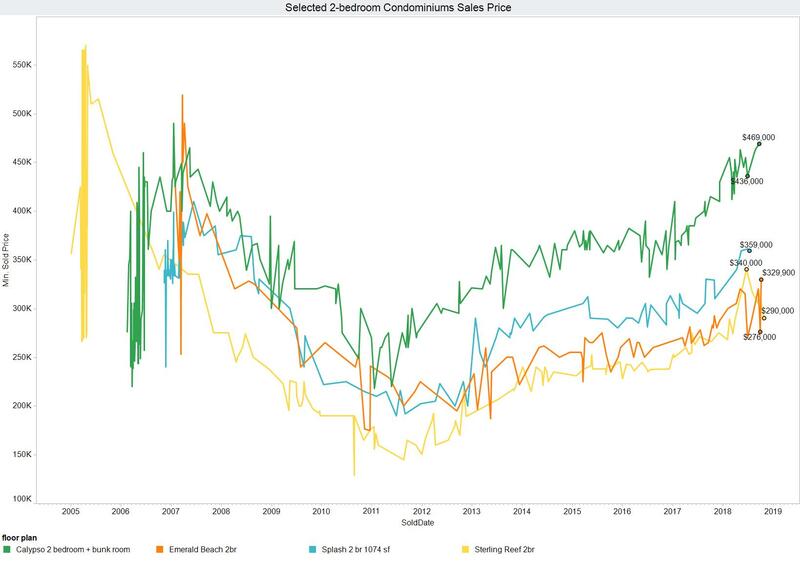 Many buildings are still selling well below original preconstruction prices. Graphing specific condominium buildings and floor plans is one of the best ways to evaluate Panama City Beach condos for sale. You can see a huge sales price and Dollar-Per-Square-Foot price difference between Calypso Condominium and Sterling Reef. There is good reason for this. It is like comparing apples and oranges. Calypso is a resort style condominium that is truly walking distance to Pier Park. Sterling Reef does not have the amenities, location, or floor plan Calypso does. There is a reason why each individual building and floor plan sell at the Dollar-Per-Square-Foot price they do. Be weary of someone telling you about an unbelievable deal you can’t pass up. I challenge anyone to show me the gulf front condo they purchased below market price. I will quickly make you aware of the condo association loan you were not aware of, multi-million-dollar renovation that is about to begin, or a host of other things that affect the value of each individual condo. This is not to say there are not values out there for the rare buyer strictly looking at the numbers. It is simply that there are reasons for the current sales prices. Watch out for rental projections. I have actual net and gross rental histories for many floor plans in Panama City Beach. I have only seen one company with rental projections that are remotely accurate. Most of the actual rental histories I see fail to show true net-rental income that actually makes it to the owner. I have to ask for the same rental history for weeks. Many times, I get three or four histories before I get an accurate net-rental income. If you don’t know what to look for, you are unlikely to get an accurate net-rental statement. 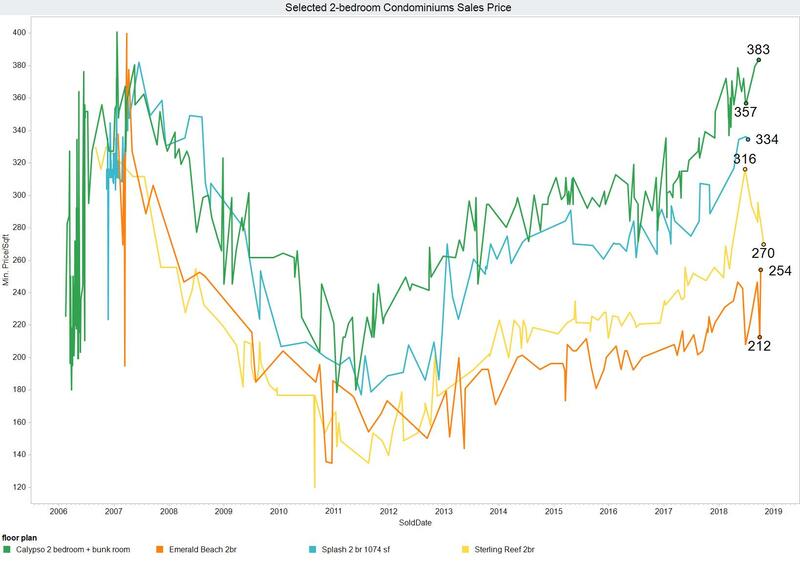 Pricing is continuing to push higher over time. Panama City Beach is continuing to improve. While the Front Beach Road Project is moving at a snail’s pace, it is a phenomenal project. The city is also working on the Bay Parkway Project. This is essentially adding another highway north of Highway 98 to help alleviate congestion. Panama City Beach is also bringing new quality events to the area each year. This is expanding a rental season that used to be limited to Memorial Day to Labor Day. As the area continues to improve, prices are likely to reflect that. I stayed in my gulf front condominium for Hurricane Michael. It was a real Category 4 Hurricane. Gulf front properties in Panama City Beach held up well for Hurricane Michael. Most high-rise condominiums hold up very well during hurricanes. FEMA, National, State, and local government did a great job after the storm. With any storm of this size, things are going to be harry for weeks after the storm. You will be without electricity, cell phone, internet, water, gas, food, and have limited access to emergency services. It took about three weeks to get Panama City Beach back on its feet. Panama City is a different story. Trees falling on utility poles and houses cause long lasting damage. It will be months before Panama City is back on its feet. This is causing overwhelming traffic in Panama City Beach on highway 98. Many gulf front condos are occupied with contractors staying for weeks or months. This will make showing property more difficult. These factors are going to impact gulf front condo sales volumes in the fourth quarter of 2018. Last updated on 14 November 2018 .